For federal elections, absentee ballots will be in the mail beginning 47 days before the election. For elections that do not include federal offices, absentee ballots will be in the mail beginning three weeks before Election Day. All absentee ballots are sent to the polls to be counted on Election Day. Voters may verify their registration, polling place, sample ballot, and absentee ballot status at My Vote Wisconsin . Absentee voting locations are established by the Common Council at least two weeks before absentee voting begins for an election. In-person absentee voting locations and hours. Send your absentee request to voting@cityofmadison.com. Be sure to include your name, address at which you are registered to vote, email address to which the ballot should be sent, and a copy or picture of your voter ID (if not already on file in the Clerk’s Office). The deadline to request an absentee ballot is 5:00 pm the Thursday before the election. You will receive your ballot and absentee certification statement as attachments to an email message. You will need to print the ballot and certification statement on paper and send them back to the City Clerk’s Office through the mail. 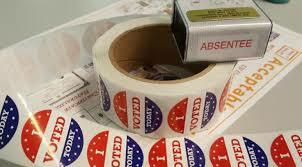 Absentee ballots must be received in the Clerk’s Office in time for delivery to the polls on Election Day. Ballots will be mailed out through the Thursday before the election. Absentee ballots must be received in the Clerk’s Office in time for delivery to the polls on Election Day. Any voter who resides in a qualifying care facility and requests an absentee ballot will have their ballot brought to their facility by Special Voting Deputies. This process, known as SVD voting, is the exclusive means of absentee voting for occupants of residential care facilities and qualified retirement homes. Special Voting Deputies (SVDs) are election officials who are trained and deputized by the City Clerk to perform the duties of SVD voting. SVDs will visit each facility two times in the three weeks prior to each election. The scheduled days and times will be publicly noticed and posted at each facility. SVDs must make two attempts to deliver an absentee ballot before that ballot can be mailed to the voter. You may email your absentee request to voting@cityofmadison.com. Your request should include your name, the address at which you are registered to vote, and the email or street address to which we should send the ballot. If you haven’t already submitted a copy of your voter ID to the Clerk’s Office, you will need to include a picture or scan of your ID with your request. Your ballot will be included in the first batch of ballots we mail out. For the fastest service, request that we send your ballot to an email address. Sign the certification statement and have a U.S. citizen who is 18 or older sign the certification as a witness. Your witness will need to write their address under the witness signature. If you cannot find a U.S. citizen nearby, you can have a U.S. citizen witness via Skype. You will need to mail the absentee ballot, sealed in an envelope with the certification statement attached to the outside of the envelope. Once the witness signs your envelope, they will need to mail it to the City Clerk’s Office. The envelope bearing the certification statement should be sealed in a larger envelope bearing the words, “Absentee Ballot Enclosed.” Your name and ward number (found above your name on your absentee envelope) should be written legibly on the mailing envelope. We must receive your ballot by Election Day.